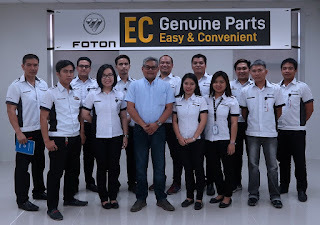 Foton Philippines is making it a lot easier for its owners to order and buy parts with their new EC Genuine Parts Program. Launched last March 19, the Foton EC Genuine Parts Program greatly improves the operational efficiency and reduces the downtime typically associated with vehicle spare parts acquisition. Through a centralized hotline, Foton vehicle owners may now place an inquiry and even order a needed spare part. The part will then be shipped to the most convenient Foton dealership for pick-up and payment. “Because of the incessantly growing number of Foton vehicles in the country, we are taking our customer service to the next level by facilitating a program where we could give all Foton vehicle owners exceptional value and total convenience in parts supplement.” said Foton Philippines Vice President for Spare Parts Division Mike Sta. Maria. Customers may get in touch with a Foton EC Parts Representative through: +63 999 999 9996. From there, the EC Parts Representative will give feedback with regards to the availability, price, and location of the needed spare part. In case, the part is not in stock, it can be shipped to the most convenient authorized dealership for pick-up once it’s available. The Foton EC Parts Program covers both Foton’s passenger car and light-duty truck line for both vehicles within and out of warranty. “It’s basically getting what your Foton vehicle needs in just a single text or call,” noted Sta. Maria. “In this manner, we are boosting customer brand confidence not only in our products but also in our after sales services, as it is equally important with unit sales as well.” he added. “Foton Philippines will continue to drive the extra mile through conducting new programs that will give customers a satisfying experience from sales up to aftersales.” closed Sta. Maria. Guess that's what this is all about - increase reliability by ensuring that parts are readily available. A page off the Toyota hymn book - maraming piyesa.